Notes: Adapted from a collectible card game of the same name. Kyota is a fairly typical high school student with a dream of breaking into the music business. Lately he and his band have been developing a bit of a cult following and encouraged by his old friend Yoriko, it seems as if he is finally going to have the opportunity to seize his dream. Unfortunately, both Kyota and Yoriko have destinies that go far beyond the mere music industry. Soon they will found themselves swept up in an ancient struggle between several mysterious factions. When I saw the first scene of this show, the first thought that entered my mind was, "I hope this guy isn't as much of a jerk as the lead from Kaikan Phrase." I had gone into this show with absolutely no knowledge of what to expect. I ended up watching it initially just because I liked the title. Though the music aspect was obviously the first impression, it was right about the time the mysterious girls in columns of colored light began showing up and fighting each other that I realized this wasn't just going to be Kaikan Phrase with a lower percentage of bishonen. It ends up being a kind of fusion between Kaikan Phrase and X. Ancient struggles between various supernatural factions are hardly unique in anime, but Aquarian Age has an unusually large number of active factions. There are at least five main groups and a number of individuals with their own private agendas. Each of the factions seems to get at least a few characters with screen time, so there soon is a large number of characters showing up and competing for screen time. I must comment that this show does a rather good job of integrating Kyota's new music career with all the supernatural conspiratorial wackiness that is going on around him. I was a bit dubious if they would be able to pull it off and have it make sense. 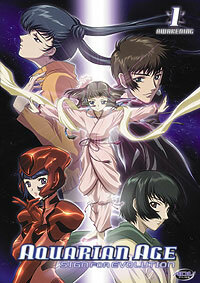 Another large component of the show concerns the relationship between Kyota and Yoriko. Obviously they feel a lot more strongly for each other than they initially realize, but the various exceedingly troublesome baggage that comes with being caught in the middle of a supernatural war complicates matters. I can't say that their relationship was as interesting or as moving as many others but they still are both fairly likable. Characterization for most of the leads is fairly decent and I was particularly pleased that Kyota actually was a nice fellow as opposed to some overly arrogant rock star stereotype (though they do have a character like that even he is a bit more than he seems). Unfortunately, the characterization for a lot of the other characters isn't as deep. A lot of this stems from the overcrowded nature of this show. With only thirteen episodes and all those factions, there are just too many people and not enough time. The primary reason for this overcrowding concerns the lineage of this show, as Aquarian Age was adapted from a collectible card game. While I have never played the game, it is a bit obvious that in attempting to make sure that everybody's favorite faction didn't get left out, they put too much into the anime itself. The CCG heritage also leads to a bit of annoyance in that they do not do a very good job of explaining what the real differences in the abilities and motivations of the various factions. The main explanation of even who all the factions were was summed up in one scene. While I don't normally desire a lot of unnecessary expository dialogue (show not tell is a vital principle of drama after all), in a short series like this with so many competing factions, it is easy to get confused about who exactly is doing what to whom and why. There are cryptic messages at the beginning of the show about the dawning of the new age and all that, but as far as I remember (it has been over a year or so since I saw this show), that wasn't really explained. In the end, the series is just really too short to make proper of the potentially rather interesting universe with a number of interesting factions. The ending is a bit rushed and had they had more episodes to work with, say 26 or 39, Aquarian Age could have potentially produced a truly epic and engrossing story line. A bishonen variant of the card game apparently inspired a manga that is not particularly related to the anime to the best of my knowledge. Moving away from the plot and story development, the character design and artwork is fairly good. I liked the diverse number of character designs most of which were rather appealing. The animation, though, is kind of a mixed bag. A lot of the action scenes, for example, are shown as far away battles between colored light columns and even when they show close ups of the action, you often just see a lot of scenes were one combatant is in their colored background and the other is in their own. While a certain amount of this can be attributed to stylistic choices, I can't help but wonder if it wasn't a cost cutting measure. Musically this show is superb. While the songs of Kyota's band, TL Signal (which is an actual Japanese J-Rock band), are pretty good, the background music, much of it done by the talented Kajiura Yuki is quite excellent and wonderfully evocative. Recommended Audience: There is a lot of supernatural violence but it tends to brief and relatively bloodless. There are a few characters with lycanthropic powers and their transformations might frighten some smaller children, but for the most part this is alright for most audiences. A bit of fan service here and there but nothing particularly severe. Overall, this is safe for older children and above.